When we work on whole-house re-wiring projects in the Tampa, FL area, we make sure that we adhere to all local building codes. Just like the roof that sits on top of your home and the appliances that you use on a daily basis need to be replaced every few years, so does the electrical wiring in your house. 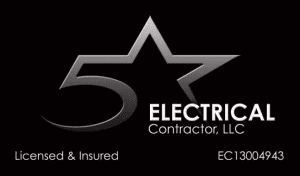 Whether your home’s wiring is older and deteriorating or it works incorrectly due to a poor initial installation, turn to us at 5 Star Electrical LLC for whole-house re-wiring services. When we work on whole-house re-wiring projects in the Tampa, Florida area, we make sure that we adhere to all local building codes. We encourage you to keep in mind that while re-wiring your entire home is an investment, it is one that is associated with many different benefits. For example, when you re-wire your home, you reduce the risk of an electrical fire occurring and protect the safety of your family members. We realize that when your home undergoes such a large-scale electrical project like re-wiring, it can be difficult to go without access to electricity throughout your property. For this reason, our highly experienced, qualified electricians work efficiently during the whole-house re-wiring process to ensure that the project is completed on time. However, this does not mean that they ever let the quality of their workmanship slide.